Let’s face it – you the readers see a lot of our favorite vehicle picks from various shows. And while we’d like to think we have quite an extensive repertoire of favorite rides among us that hit even the furthest stretches of the hot rod community (here’s to you Concours lovers and rat rod enthusiasts), sometimes it’s good to change things up a bit. So, in addition to our already immense coverage of the 2017 SEMA Show, we decided to employ the help of a couple celebrities to pick some of their favorite vehicles on the show floor. There’s just something so iconic about a Tucker you can’t deny. Styles certainly picked up on this, and we think you’ll agree with his choice of SEMA Show car. Our first pick comes from the incredibly talented painter and pinstriper Jeff Styles of California-based Styles Custom Paint & Pinstriping. An automotive enthusiast through and through, you could say Styles has an eye for old-school cool, as well as impeccably done customs. His choice – a custom 1948 Tucker (yes, you read that correctly) – speaks to his eye for the impressive. Built by Rob Ida of IDA Automotive in Morganville, New Jersey, this incredible car was found in the Axalta booth on the SEMA Show floor this year, bringing back memories of a manufacturer long since passed, but not forgotten. Though the car may look very much like a modified yet original Tucker 48, it is actually a recreation of the famed model. Don’t worry – Ida did not cut up one of the original 50 Tucker 48s to build this amazing piece of automotive art. But the story behind this particular Tucker makes it, in some ways, even more special than an original. As the story goes, Ida’s grandfather was a Tucker dealer back in the day. While he took orders for the then newly released automobile, he never delivered any of the cars due to unforeseen governmental meddling in creator Preston Tucker’s affairs. After Tucker was shut down, all of the cars were auctioned off and destined to either be forgotten or holed up in distinguished collections all over the world. Having had a love for Tuckers for decades, Ida’s grandfather wished for the chance to own one of the obsolete 48s, even long into his retirement. But getting the funds to buy an original Tucker just wasn’t feasible, as prices on the cars quickly skyrocketed, that was, if you could even find an owner to talk numbers with. So, Ida decided that he would build his grandfather his own Tucker, fabricating everything by hand and coming close to the original Tucker 48 platform. Everything you see on this car is hand built, from the body panels to the brightwork. It may look like an original Tucker, but this is truly a model all its own. That was 1999, and Ida’s grandfather was in his 80s. 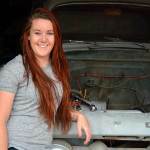 Unfortunately, just as Ida was finishing the car, his grandfather passed away. But that was only the beginning of a new-found relationship with the famed Tucker brand. Since 2000, Ida has built four Tuckers. Strictly a labor of love, Ida doesn’t build the cars for fame or money. 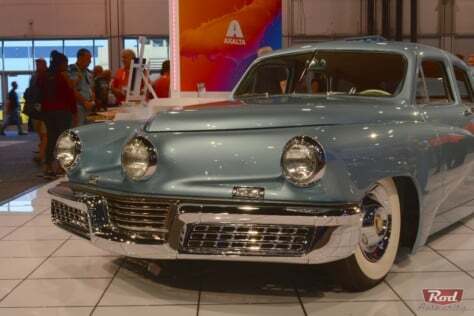 He builds them because of his passion for the Tucker brand and what could have been, had Preston Tucker succeeded in his automotive endeavors some 65-plus years ago. And he does it with the blessing of Tucker’s great, great grandsons. Originally started as Ida’s personal car, the Tucker shown at SEMA took about six years to complete. Along the line, long-time customer of Ida’s, Jack Kiely, took interest in the car and Ida offered to finish out the build for him in time to show the car at the 2017 SEMA Show. The car was finished in August of this year and made it’s debut at the show. No, you’re not seeing things. 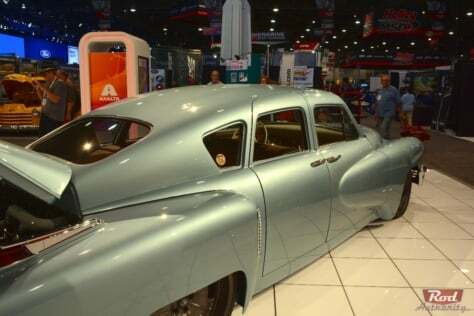 The wheels and tires on the Tucker differed from driver’s side to passenger’s side on the SEMA Show floor, but Ida tells us the Tucker will more than likely spend most of its time outfitted with the Firestone whitewalls and 1947 Cadillac Sombrero hubcap combination from the driver’s side on all four corners. Just as we mentioned before, this car is completely hand crafted. Every custom-made body panel, every one-off trim piece, all the interior, everything was done in-house by Ida and his crew of five employees. Just the sheer number of hours that went into perfecting each piece of custom-formed sheetmetal and chrome piece on the car is astonishing to think about. While she looks mostly period-correct, everything mechanical on the Tucker is modern, from the drivetrain down to the Tucker radio converted to work with your smartphone for satellite radio, Bluetooth, and GPS capabilities. While Ida’s former Tucker builds were a little more “hot rod” if you will, this particular Tucker was built to look very close to the original 48s, from the way the door handles lay, to the brightwork along the sides of the car, all the way to its stance. Compare Ida’s Tucker to an original 48, and even the utmost experts in the Tucker brand would have to look twice to see that this is truly a recreation rather than a modified original. One thing that certainly isn’t Tucker 48 original looking, however, is the fat Cadillac V8 stuffed between the front and rear axles. Seemingly a rear-engine car like Preston Tucker designed his cars as, this Tucker is what Ida considers a mid-engine vehicle as the powerplant sits in front of the rear axle. Along with the Cadillac V8, which sits in the car sideways mind you, the Tucker makes use of the matching Cadillac transaxle and twin turbochargers for a little extra oomph. All said and done, the car is pushing about 500hp. Sitting on an air ride suspension from RideTech so you can get that original-like Tucker stance on the high side and a more rodded-out stance on the low end, the Tucker runs all modern mechanical components, but in a package that appears more period-correct. For example, the lollipops on the dash, which in original Tucker 48s controlled things like air circulation, etc, have been configured to be the air suspension adjustment levers. Not the most popular choice by engine standards these days, Ida's Tuckers are powered by Cadillac V8s because they make good power and as a whole package, they are the perfect fit for the car, he told us. However, if he were to have designed his Tuckers more recently, he admits he may have gone more with something like the LS to power them. Another example: the shifter, which in the original Tucker 48s was a pre-selector for the gear you wanted to go into, which was then actuated by stepping on the clutch pedal, works similarly in Ida’s Tucker, just using a modern transmission and electronics. Another: the center headlight, which does in fact turn with the steering wheel, runs not by Tucker’s original design but by technology found in some modern vehicles today. Finished in a custom Axalta mix with modern metallic, mixed by Ida to be very close to the original Tucker paint color Waltz Blue (an ode to Preston Tucker’s wife who loved to waltz and would wear a similarly colored blue dress doing so), this amazing piece of rolling art is beyond anything even Tucker fans could hope to see in a commemorative Tucker 48 build. Fittingly, one of Tucker’s great, great grandsons was on the SEMA Show floor and stopped by to show his support of Ida’s Tucker during the week. According to Ida, both Sean and Mike Tucker are very supportive of his Tucker builds and they even come and lend a hand on the cars when they can. Back to Styles – we told you he had good taste, so what drew him to pick this particular car? “I love the story and how rare the Tucker was, and then hearing the story of the guy there –Preston being his great, great grandfather – and how this car was completely hand built,” he told us.